The Circle Y has had horse herd since 1937. The herd at times numbered close to two hundred. Horses were used on the ranch for riding and driving. Many stories have been told of just getting a team working nicely and having my grandfather sending them off to Ontario to be sold. In the fifties my Grandfather bought a couple of carloads of Shetland ponies. They were raised and shipped east. In 1961 my father bought our first registered Quarter horse stallion. His name was Bear Trap P-115,573 a son of Bear Cat from the Birdtail Ranch of Simms, Montana. 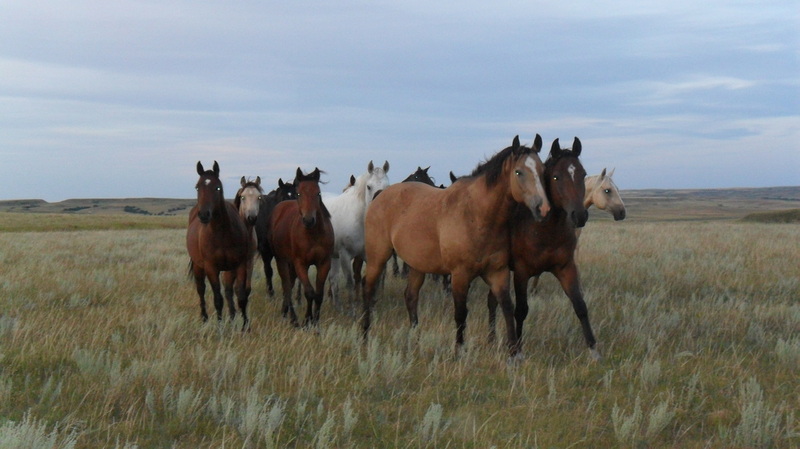 In 1964 the first 4 purebred mares were purchased in Moose Jaw from Royal Burrows of Midnapore, Alberta. They had foals at side off of Alberta Jack and were bred back to Poco Sunday. These were the horses that were the foundation of the Circle Y herd with only a few more mares purchased over the years. Our next stallion was Que T Hush #446471 a son of B Wood a half brother to LEO. We bought and used an aged stallion Sonny Bar Showdown that had Wimpy P-1, Blondy’s Dude and Sonny Dee Bar on his papers. For four years we used the double bred Peppy San stallion Solanos Double San. 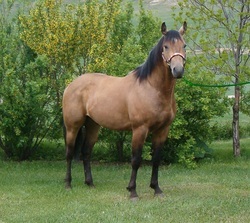 In 2002 we purchased our current stallion the buckskin Holiday Compadre 3926839. Many of our mares carry the influence of Bear Trap and Que T Hush. True to the heritage of the quarter horse our horses have been very versatile. They have competed in the rodeo arena and the show ring. They are used for ranch work at home as well as play. The kids have done gymkana and we have gone team penning. We have horses for sale at most times. Since the early days of the Circle Y we ran steers until they were two, three and four years of age fattened on the grass. They were then shipped to Winnipeg for sale. Some were shipped farther east to southern Ontario for final finishing on corn. As grain feeding became more prevalent we sold mostly yearlings and some two year olds to Ontario for grain finishing. These cattle made the trip east in cattle cars on the trains. Loaded in Big Beaver they traveled up thru Moose Jaw to Winnipeg thru northern Ontario to Toronto and down to the Chatham area. They would be unloaded for feed and water a couple of times but it was a long trip. We sold our yearling steers and heifers to the same buyer for forty years. In the early 1990’s I wanted to make the change from running yearling cattle to running a cow herd. I started with some auction market heifers using long horn and Watusi bulls for their low birth weight as we were calving out close to one hundred head of heifers those first couple of years. 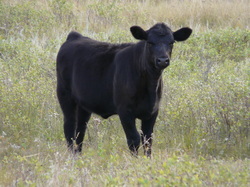 I made a strong commitment to the Black Angus breed in 1995 purchasing 45 purebred heifers from John Franks at the Short Grass Angus bull and heifers sale that spring. I am trying to build a very thrifty fertile cow herd that thrives on the short dry grass of the rugged Big Muddy Badlands. My bull battery has included bulls from Dale Fellman of Jordan MT. They possessed the bloodlines of Basin Rainmaker, Basin Emulation and Home Run. I have also used bulls from John Franks' Double J herd. I used sons of DDA Banjo 1B and DDA Fahren 51. I also used a son of Alberta Traveler 416. As of late most of my bulls have come from Merit Cattle Company of Radville Sk. Those bulls include sons of Ebon Hill Equalizer 117’97, Lukens 9440 Scotch Cap L463, Sitz Alliance 6595, TC Advantage and OCC Magnum 749M I generally just raise a few bulls each year for my own use. We background our calves over the winter and have started to develop a market for our ranch raised heifers for replacements. We have ran our calves over on grass as well as sold them off in the spring depending on the drought outlook and market conditions.